A while back I was at San Francisco airport inside the Virgin Airlines terminal waiting to catch a flight back to NYC. I had about 2 hours to kill so I was looking for a place where I could quietly sit with my ipad and enjoy as good a meal as one can get in an airport. I’m a huge fan of Iron Chef so when I saw that Cat Cora had a little cafe inside the terminal (the Virgin terminal is apparently the best when it comes to food), I had to go take a look. The menu wasn’t cheap but I liked that the area was a little more private than the rest of the airport. I sat down and ordered a tomato basil soup accompanied with a gruyere grilled cheese sandwich. What can I say other than this soup was the best tomato basil soup I’ve ever tasted. 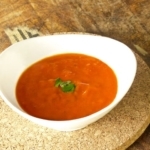 Was it the San Marzano tomatoes that made the soup taste so fresh and healthy? And what about the heat from the cayenne ever so present in every spoonful I gobbled down? The sandwich was also spectacular; sweet caramelized onions and savory gruyere stuck between two thick fresh slices of bread, melted until the perfect gooeyness is achieved. For the big finish, I dipped a slice into the soup and voila; A new obsession was born. Now I must try and recreate these simple dishes at home. The tomato basil soup I created is all mine; I don’t know what ingredients Cat Cora uses for hers but mine is pretty darn close taste wise. It’s very GOOD. As far as the gruyere grilled cheese sandwich? You’ll have to wait until tomorrow’s post 😉 . In a large pot on high heat add 1 tbsp butter, olive oil, garlic, onions, thyme and chili pepper flakes. Cook for 5-7 minutes, until onions are translucent. Add crushed tomatoes and all 5 tomatoes. Cook for 3 minutes then add 1 cup of water. Bring to boil, add half of the handful of fresh basil, lower heat, cover and simmer for 40 minutes. Halfway through, add 1/2 cup of water, stir well and cover. It’s good to check on your soup every 10 minutes or so to make sure the bottom isn’t burning. Use either a hand mixer or blender to puree your soup. Add the salt, remaining butter and water, and stir well. Season some more to adjust the taste and/or add a little water if you prefer it to be thinner. Excellent. I made this with olive oil (vegan) and ate it with panisse.